That didn’t take long for Sabrina and her Mom to clash. And Sabrina’s tattoo joke was in reference to both the great Samoan wrestlers of wrestling and Disney’s movie, MOANA, which co-starred the Rock, and is the genesis of the joke. But, taking family photos would seem to be pretty harmless, right? Thanks to Dave for another great page! You’ll want to keep an eye on his page because he’s got some comic plans after this story concludes. Speaking of Moana, I liked the movie very much. Not as much as Tangled, but up there with Frozen and Little Mermaid. 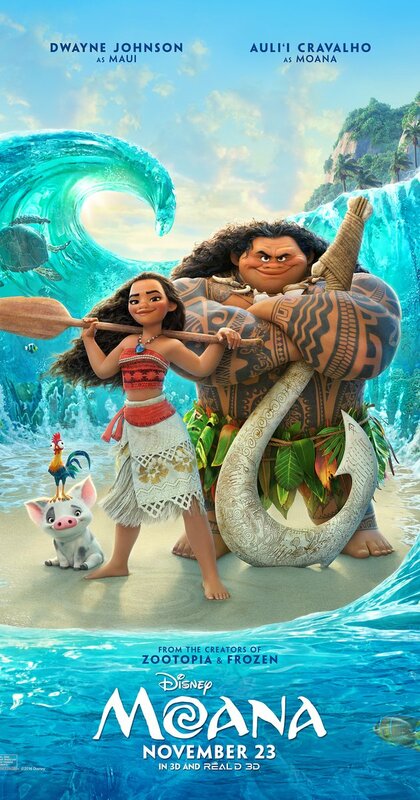 Naturally the Rock was excellent and Auli’i Cravalho was very good as well. Solid story with some laughs and a protagonist you can get behind. Wrestlemania is coming up this Sunday. Whose got a master lock pick for match of the night? Will the Andre The Giant Battle Royal be a bust (like most recent battle royals) or will it shine? I’m hoping for a strong showing from Shamus and Cesaro, if nothing else, by virtue of their entrance. A shame that Austin Aries vs. Neville is on the pre-show. And will Bailey keep her belt from Nia, Charlotte and Sasha? I suppose the easy money is that Nia eliminates Charlotte and Sasha turns on Bailey. What’s with Sabrina’s mom and Brooke? What do you mean? Olivia has gravitated towards Brooke, and said last update that Brooke reminds her of herself when she was younger. Must have missed that update. It would be nice to see the family photos of the past to see a happier version of Sabrina and her mom together. I mean the difficulty of them tolerating each other is as thick like a spaghetti noodle. She’s got that one and then the one on the back of her neck. Olivia is unhappy with all of them. The shirt color and hairstyle is a *little* different, but yeah, I could have placed it a bit better to make it more clear. I feel the same way whenever someone makes a Game of Thrones, or Downtown Abbey reference. That’s the problem with Pop Culture, not everyone is always going to get it. Brooke is wearing orange in this update *eye roll*…plus, Brooke’s hair is wavy, and Brina’s is straight. Yay! and congratulations on being up to date. 🙂 I hope you enjoy the rest of what’s coming. brock gets his revenge as the match goes beyond the two minute mark and Goldberg gets gassed. bayley retains since she’s been eating the most pinfalls of the four, everyone eliminates nia first. hhh and rollins beat each other up, joe interferes but is stopped by the return of THE DEMON BALOR! no one notices rollins getting the win during the DEMON’s entrance. bray keeps the title thanks to rowan’s return. don’t remember anything else that may be on the card. You’re crazy if you think they’re going to push Naomi to champion status. Doesn’t matter if it’s her hometown, she loses. She is the champ NOW, but will she keep it? don’t forget they’re playing the “champion has to give up the belt due to injury” thing with Naomi so her winning back the belt she never lost here is a logical outcome. naomi’s just kinda there for me at this point though, i’d just as soon alexa keeps it but I can see her losing the belt. of course it would help if they ever got around to explaining what the rules of the match were you know, before the match actually starts. To me, they keep the rules vague because THEY don’t know what’s going to happen for sure. This keeps their options open. So, I don’t know. I could see Alexa coming out the champ, but I’ve heard the backstage aren’t high on Alexa’s work. More’s the pity.